Back in the saddle for Part 3 of our series on Fatigue today. In previous posts, we’ve introduced the concept of Anticipatory Regulation, and contrasted it with the theory of “limitations” of exercise performance. We introduced the pacing strategy concept, which is often dismissed as “obvious” (because it is! ), but is in fact one of the most complex, and meaningful characteristics of exercise performance for physiologists. But before we tackle that, it’s important to discuss briefly how these studies are done, because it has major implications for what conclusion is eventually drawn from them. So today’s post looks at “real-life” vs laboratory science, and its implications. In constant workload trials to exhaustion, the exercising athlete is “forced” to cycle, run, row (or do any other exercise) at a predetermined intensity until they themselves choose to terminate the exercise bout because they are unable to maintain that required intensity. This includes the well known VO2max test, where a runner or cyclist starts off at a comfortable pace, and the intensity is increased every minute or two until the athlete cannot continue any longer (or falls off the treadmill, something most physiologists have experienced!). In this test, performance is measured as either time taken to reach the point of voluntary exhaustion (the athlete says “that’s it, I feel close to death and can’t carry on!”) or the total work done (distance covered, kilojoules used etc.) before that point is reached. What is crucial to recognize is that the athlete has no idea of how long they will exercise for – the instruction is to “go until you have to stop”, which means exercise is completely open-ended with the athlete determining the duration. This removes any aspect of pacing, and since there’s no known “endpoint,” adjusting the pace appropriately would be meaningless and impossible anyway. Defining fatigue as an “event”. That is, fatigue is a distinct moment in time when the athlete decides to stop. It is therefore an “all-or-nothing” event, black or white, yes or no, on or off. One could compare it to an “off-switch,” where the athlete exercises until such time as “the lights go off!”. This definition is clearly not appropriate for cycling or running races (though it’s entirely appropriate in this kind of study), for when you are taking part in a race, you recognize that fatigue is more complex than simply a point at which your lights go off! Establishing at what physiological point the “off” switch is reached. The researcher is able to narrow physiology down to one or two variables and control for others. It reduces the complexity of performance quite dramatically (though it’s certainly still very complex), and enables the scientist to adopt what one might call a “black box” approach. They can measure as much as possible, and then infer backwards from the “fatigue point” in order to appreciate what caused fatigue in the first place. When we talk about exercise in the heat, you’ll see a great example of how this has been done. Basically, this cartoon illustrates what physiology is doing when we fix the workload and let the athletes exercise to fatigue. Effectively, it is stressing the human body to the point where it “breaks”, and fatigue occurs. Then, once that has happened, the researcher goes back, analyses the physiological situation when that fatigue “occurred” and deduces that the cause of fatigue was X, Y or Z. For example, one might make athletes exercise in hot conditions, and find that fatigue always happens at a body temperatures of about 40 degrees Celsius (104 F) (this is true, as we shall see in the series moving forward). In that case, one could conclude that the high body temperature has caused fatigue, as we have controlled for everything else. Similarly, you might find studies where athletes exercise to exhaustion in a VO2max test. And because they reach the “VO2max”, the conclusion is made that a limitation of oxygen delivery caused the athlete to eventually stop exercise (or fall off the treadmill again!). 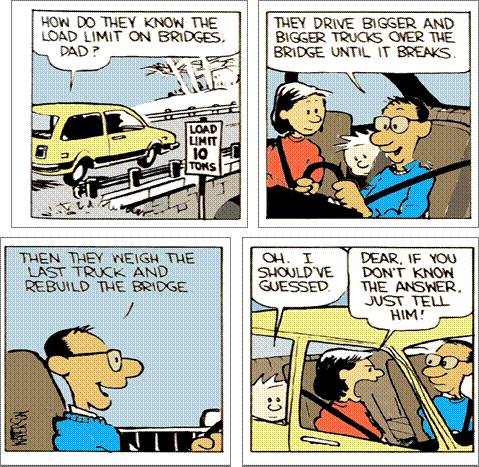 The fatigue, then, is analogous to the “load limit” in the cartoon, with factors like temperature, metabolites, and oxygen availability all representing “trucks” that cause the bridge to break! This kind of constant workload test, as I’m sure you can appreciate as you read this, is not exactly representative of what happens when you go out and exercise. Because regardless of what you do, either in training or racing, there is hardly ever a situation where you do not have a choice to slow down before you stop. In a laboratory, doing exercise at a fixed work rate, this choice does not exist for you! You either exercise or you don’t, whereas any other exercise affords you the chance to slow down. And, as we’ve discussed in Part IB of this series, it’s this ability to slow down (and the regulation that controls HOW and WHEN you slow down) that is crucially important for understanding physiology. But this technique does NOT explain how performance is regulated, and problems develop when scientists begin to apply these findings to all situations. For example, when a physiologist proclaims that “Impaired exercise performance in the heat of Beijing will be the result of high body temperatures causing fatigue“, then they are stretching the truth, and lying to you by taking their finding out of context! This happens very often, and is a big reason for the sometimes aggressive debate between the two models we introduced in our last post. This is a rather obvious concept – the athlete in the lab is made to do a “simulated” time-trial, over a known duration, and the power output or running speed is free to vary, at the athlete’s discretion. Performance in this kind of model is defined by the time taken to complete a known distance, or a known amount of work, or distance covered in a known time. The key to this kind of study is that there IS a known end-point, so the athlete has an idea of what lies ahead when they start exercise. This enables the “pacing strategy” to come into play, as discussed previously. If the Constant Workload Trial we discussed above represents the “ON-OFF” switch, then this kind of self-paced trial is the “DIMMER” control on your lights. Because instead of a situation where the light is on until it goes off, here we have a situation where the athlete is able to constantly modulate the workrate, up and down depending on the set of INPUTS they are receiving. The key question for physiologists everywhere, then, is how is this achieved? Returning again to the heat example, the challenge is to figure out how the athlete is able to adjust work rate to prevent the limit from ever being attained. This kind of exercise is also more “realistic” if you want to compare it to most exercise types and actually apply the findings from your study. That is, when you go out for an 8km training run, you are effectively doing a sub-maximal exercise bout which is self-paced, with known duration, just as you would do in the lab. That means that application and inference from this kind of model is possibly more realistic than a model where workrate is fixed and duration is unknown. There are, of course, some big differences. For one thing, when you go out to run a 10km race, you’re not really doing a “self-paced” trial, because there are other athletes in the race who have an equally large impact on your selected pace. So perhaps, for a race situation, one might say “freely paced”, and then acknowledge that other runners, motivation, and numerous other factors affect the “self-paced” intensity! The point is that ultimately the athlete is still able to increase or decrease the exercise intensity, and this is a “self-selected” pace, regardless of which INPUTS are responsible for the pace. This sets the scene for the previously discussed “Anticipatory Regulation” (see the model at the end of Post IB for more on this concept). Another difference is that exercise outdoors throws up a number of variables that are difficult to replicate in a lab. For example, changing wind and temperature conditions, gradients, road surfaces, and surroundings all exert an effect on performance during training or racing, but are limited in labs. We can, and do, try to control for this, but it does of course limit the contextual application of research to outdoor competition, and is one reason why to this day, with so much knowledge, we still actually know relatively little about performance physiology! As we’ve said, if anyone tells you that they know the TRUTH, they’re lying…ignorant…or both…! As I mentioned at the top of this post, the next few posts will look at pacing strategies during exercise in different conditions. But we’ll also look at the constant workload model, and compare the conclusions made from these studies with those made in the self-paced, time-trial studies. Once again, exercise in the heat provides the best example of this, because in this area, there have been some excellent research studies using constant workrate trials, which have concluded that fatigue is the result of high body temperatures acting on the brain. As described above, the problem is that these types of trials create a situation where that is really the only conclusion possible, because the trial is set up to evaluate a “forced” physiology leading to a distinct failure of exercise. In self-paced trials, one can look at what happens to performance and perceptions of effort long before the “fatigue point” is reached, to help understand how performance is regulated. That reveals that in fact, athletes slow down long before they are hot, and suggests that performance in the heat is regulated in advance of the “failure” so easily observed when athletes are forced into maintaining one intensity. But this is all for the next batch of posts, where we’ll tackle those four scenarios in turn, and we’ll constantly be coming back to this concept of fatigue as a distinct event vs. fatigue as a regulated process!